We've driven all this part of the Alaska Highway on the way up, so about 30 miles north of Watson Lake, Yukon, we took an alternate route home, the Cassiar Highway. This road is actually a little shorter, but less famous and less well maintained. Perhaps for all of these reasons, it is much less traveled. Our newly cleaned motorhome stayed clean for about 10 miles. But it rained on and off all day today and we drove on a lot of dirt sections. I think the motorhome is almost as dirty now as it was yesterday before we washed it. C'est la vie. The scenery was better than average, but we couldn't see too much of it because of all the rain and clouds. On the plus side, we covered more miles today than usual. When the weather is bad, we don't tend to stop much. We spent the night at a private campground on a beautiful setting in the woods beside a lake. We're practically the only campers in the place, which I guess is understandable, since we're right next door to the middle of nowhere. The campground, it turned out, is owned by a couple of Californians from Novato (north of San Francisco). They come up here every summer to operate the campground. They're in the middle of building a beautiful cedar log cabin on the property. More gravel roads today, fortunately without the rain and mud. We decided to take the 60 mile road west to Stewart, on the coast. 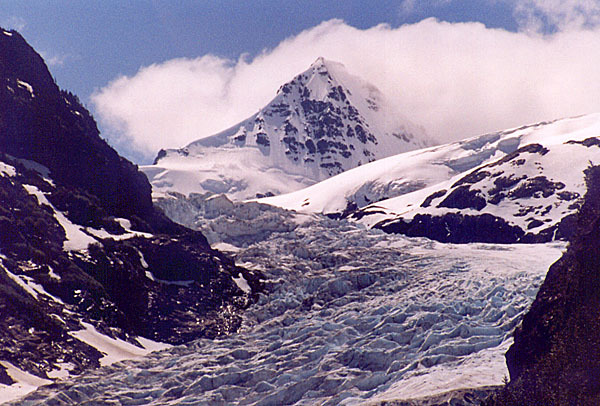 It's a beautiful road, driving through a long valley with steeply rising sides and numerous glaciers. They get a lot of snowfall and avalanches here in the winter. The road ends at the Pacific Ocean, in the two towns of Stewart and Hyder. Stewart has a population of about 1,000 and is in British Columbia. A short walk farther down the road is Hyder, Alaska, with a population of less than 100. Hyder is somewhat unique. It's by far the southern-most town in Alaska that you can drive to. I think the next one is probably Skagway, 600 road miles farther north. Once you drive to Hyder, though, your choices get very limited about where to go next. You can drive on a dirt road that goes into a national park and then dead ends, or you can return to Stewart. On our drive up this morning, Sandra and I had speculated on the possibility of moving to Hyder. It sounded like it could be an attractive place to live. Alaskans pay no state tax, instead, they get a check from the government each year, just for living in Alaska (got to do something with all that money from the oil companies). Living in Hyder is virtually like living in central B.C., with an Alaskan address for tax purposes. In fact, Hyder is so much like living in Canada that they primarily use Canadian currency. For example, the one gas station in Hyder sells gas by the liter only and the price is in Canadian dollars, not US dollars. And Hyder is too small to have much in the way of services, but Stewart has all the basics, including inexpensive medical services. Alas, when we got to Stewart, we found it to be a very drab town. And Hyder, so shabby that it almost made Stewart look grand in comparison. No, we couldn't see living here. But we did stay for the night. We explored a "nature trail" that started near the campground. A jungle trail is more like it. Huge trees and many big-leafed plants growing over the trail. In some places we couldn't even see the trail (or the ground) any more. We'd just put our hands up in the air and walk forward until we reached a clearer spot. A sign at the beginning of the trail had warned that bears liked to use the trail so we kept up a constant chatter while walking so that we wouldn't surprise any in the dense brush. We didn't see any bears, but we sure saw a lot of their poop on the trail. We finished the Cassiar Highway this morning and are now headed mostly east, rather than south. We're definitely back in "civilization" now. It seems kind of weird to see fences and homes and other developments almost non-stop along the highway. For the most of the past month, the countryside has been almost completely devoid of these signs of man. The sense of isolation and of being in the wilderness is completely missing now. Well, perhaps not completely. Twice this morning we saw a black bear beside the road. In Hazelton we paid a visit to the 'Ksan Indian Village. Beautifully carved and painted totem poles, and not nearly as touristy and commercial as I feared it would be. The artwork in the craft shop was as expensive as it was appealing. Outside the town of Smithers we stopped to explore a set of twin falls. After a fairly nasty road out to them, the falls turned out to be disappointingly ordinary. I guess we're getting jaded. But Tyhee Lake Provincial Park, where we spent the night, was splendid. For $12 you can choose from about a hundred wooded, isolated campsites, with free firewood, swimming in the lake, and even hot showers! Despite being so attractive, the place was not crowded at all. Not a very memorable day. It rained on and off and the scenery was agreeable, but nothing really special. With the poor weather, it didn't give us much incentive to stop for frolicking. We did see two more black bears today. As well as a narrow canyon with a sign identifying it as "George's Gorge." We stopped in McBride at a private campground for the night. The choices for places to stay were approximately none. The campground was likable enough, but the attitude of the owner was not. We went up to the office to check in and had to wait while the one couple ahead of us checked in. They were Americans and wanted to pay the $15 fee in American dollars. The owner said, "No problem, we give a premium of 20% for American dollars." When the Americans protested that the bank rate is over 35%, the owner said, "Well, we aren't a bank." Not wanting to accept the rip-off rates, they left. I'm not sure how I feel about this. On the one hand, the owner is not obligated to accept funds in a foreign currency at all. If the Americans want to travel in Canada, or any foreign country, they should be prepared to pay in the local currency. If, as a courtesy to the foreign guests, a business is willing to accept foreign currency and the hassles that it entails, then I suppose they can choose any exchange rate they want. On the other hand, is it really a courtesy to accept foreign funds but only at a rate that is extremely unfavorable to the guest? In defense of the Americans, they may not have bothered to carry Canadian cash because credit cards are so widely accepted. In all our traveling through Canada this past month, it has been rare to come across a business that didn't accept credit cards. However, this campground was an exception. Watching this whole episode didn't exactly endear us to the campground. Nevertheless, we observed that they had three different rates for camping -- Dry (no hookups), Electric & Water, or Full (electric, water, & sewer hookups). This is fairly standard at campgrounds and we invariably choose the Dry rate since it is the cheapest and we carry our own water and our battery provides ample power for a single night's stay and can then be recharged during our driving the next day. But at this campground, they wouldn't let us have the Dry rate. "That's for tent camping only," they said. So we were forced to purchase utilities for which we had no need, a restriction that we've never encountered at other campgrounds. And it turns out the quoted rates are only for two adults. If your camper has more than two adults, you have to pay extra. When I indicated that I wasn't pleased with this, the owner said that this practice was universal. I told her that we'd been doing a lot of traveling recently and had NEVER paid extra for more than two adults. We'd seen a few places that charged extra, but we always went elsewhere when coming across this practice. It was definitely not universal, and not even particularly common, in our experience. I don't think she cared. Having not many options, we decided to stay anyway. But after paying extra for our 4 adults, paying extra for utilities we didn't want, not accepting credit cards, and not being friendly, we weren't in a great mood. We decided we'd all take at least one shower, and preferably two, to try and use as much of their hot water as possible. We'd plug our motorhome into the utilities and run our heater to blow dry the towels even though we normally just let them air dry. And in the morning we'd fill our water tanks full and make sure we dumped our sewage tanks. Grrrrrr. A short drive to Mt. Robson Provincial Park this morning. 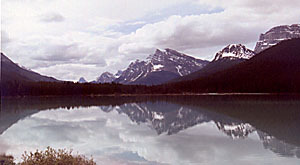 The park borders the more famous Jasper National Park. They're both extremely beautiful places. The cloudy weather kept us from fully appreciating all the mountains around us. We had no problems appreciating the Fraser River, though. It moves through some narrow canyons and over some thundering waterfalls. The falls aren't especially high, but the large volume of water flowing over them makes for quite a spectacle. We ate our lunch on the picnic tables outside the Visitor's Centre and had a lovely view of the mountains all around us. Or at least the bottom half of the mountains, since the tops were all buried in clouds. Then we hiked the Berg trail to Kinney Lake -- only a couple of hours, but a beautiful trail that required us to stop for pictures many times. We hadn't done much hiking in the past few days so we especially appreciated this opportunity. We stayed at a campground near the Visitor Centre that was fairly attractive and certainly convenient. We thought it was a provincial campground, since it's right in the middle of the provincial park. But it turned out to be a privately owned campground. Another hike after dinner revealed a second campground on the other side of the highway. This one was a provincial campground so we expected it to be cheaper. I went to investigate and found that it cost a dollar more than the private one. Odd. We only saw one bear today, but it was dashing across the road, confirming the stories about how swiftly bears can run. We also spotted our first elk today. The rain continued on and off throughout the day, but it didn't keep us from exploring the many spectacular narrow gorges and waterfalls. Every few steps the scenery looked better than before. It was hard to stop taking pictures. In the evening we visited the Visitor Centre at the Athabasca Glacier. The exhibits and displays there are excellent. You can take an "ice bus" tour out onto the glacier but it was too late in the day for us, and we weren't particularly interested in that kind of thing anyway. Jasper National Park quickly gave way to Banff National Park, where we spent the entire day. What an incredible park! The mountain views were the best of the entire trip. The park runs north/south, following the continental divide, so we had towering mountains all around us for most of the day. It even snowed on us briefly at one of the higher elevations. We stopped for lots of pictures, but didn't really have much time to explore or hike. Our plan called for us to be back in Calgary tonight, with Sandra's cousin Bart and his wife Megan. We could have extended our stay another day or so, but after a month on the road, we were all looking forward to a chance for a luxurious shower and to sleep in a full sized bed. I'm sure this was especially attractive to Luke, who is 6'6" tall and spent the whole trip trying to sleep in the motorhome's 6'0" bed. We will definitely have to come back for an extended stay in Banff and Jasper. Our two days there were just enough to see how much there is to enjoy, but not nearly enough time to explore it. But we'll leave that adventure for the future, the next time we come to visit Bart and Megan. 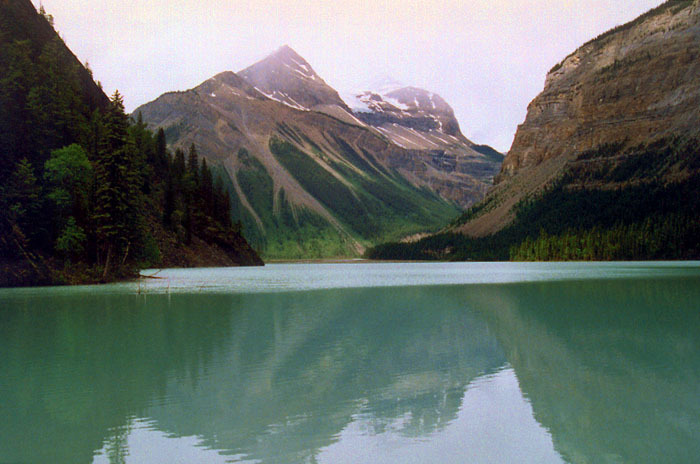 The Alaskan trip ended in Calgary, but our journey was far from over. We spent a few days in Calgary resting up before setting off for our cottage in Ontario where we would spend the rest of the summer. The cottage is another 1000 miles east of Calgary, and from there we need to return to California in September. All in all, we're doing a lot of driving this summer! A few facts and figures about the trip, for those interested in such things or who might be considering a similar kind of trip. Our trip from central California to Alaska and back down to Calgary was 7,265 miles. It took us 35 days, at a fairly sedate average of 208 miles a day. Due to the small gas tank (only 15 gallons) and the often large (and sometimes unknown) distances between gas stations, we stopped for gas frequently. In fact, 54 times! We used 524.36 gallons of gas, making an average of 13.9 mpg. With some help from Quicken, I determined that we spent $1,900 (including everything except gifts) during those 35 days, or an average of $54 a day. The single biggest expense, $566, was for restaurant meals, where we usually ate once a day. Gas was our second biggest expense at $467. It would have been our most costly category by far, except we were splitting the cost of gas with Luke and Helen when they were traveling with us.